Dr. Laura Baker has taught at St. Edward’s University in the Department of Computer Science since 1989 and has been Department Head or Chair from 1997 – 2002 and again continuously since 2008. Dr. Baker was tenured in 2000 and promoted to full professor in 2005. She has twice been selected for the School of Natural Sciences Outstanding Teacher Award (1992 – 1993 and 2000 – 2001) and once as the winner of the St. Edward’s University Excellence in Teaching Award (2001 – 2002). A published textbook author and active in her professional society, Dr. Baker has supervised more than 60 undergraduate student research projects over her career at St. Edward’s. Remarkably, since her arrival in 1989, she has been the instructor of record for more than 600 sections sections of courses (Fall, Spring, and Summer) that have enrolled more than 4700 students. Please join me in congratulating Dr. Laura Baker, this year’s St. Edward’s University Distinguished Career Award winner. I grew up on trees, rolling down grassy hills, and swimming in creeks that ran next to my house. It was the best childhood ever and for some reason I could not wait for it to end and for me to become an adult. 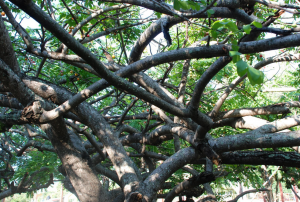 Now that adulthood seems freakishly close, I sometimes wish I could go back to being 11 years old and having a clubhouse among the branches of a plum tree. Our pet was a toad, which escaped the crate we had created for him and seemed to have survived the fall because we did not see him again after that. As an 11 year-old I failed to take care of a toad, but then again it was probably fine without my help in the first place. As some version of an adult that I am today, I hope to do a better job taking care of the planet than I did of a toad when I was 11. Our clubhouse plum tree looked a lot like this. I almost want to say that the world is a playground but it feels more like someone than something, and it seems wiser than me. In an effort to catch up and understand Earth a little better I decided to apply for EcoLead, a global, environmental leadership exploration program, designed by faculty and staff from the Environmental Science and Policy department and Student Life at St. Edward’s University. Ecolead has been an amazing experience that takes me back to the creeks, trees, and grassy hills from my childhood, and reminds me that adulthood is as exciting as it seemed when I was 11. I’ve met other tree people, creek lovers, and grassy trailblazers. We are recording our experiences in a blog called A Costa Rican Almanac. In our entries we also identify current environmental issues, do research on them, and offer sustainable solutions. To see how our view of the world evolves as we go through this experience, follow the link bellow. No action is too small when the needs of the world are great. After nearly completing the Mobile Apps course (COSC 3325) here at St. Edward’s University during the Fall 2015 semester, three computer Science students (Sophie Gairo, Gage Martin, and Maria Bisaga) felt excited to explore different opportunities that would allow them to take the knowledge they learned in class and expand it to new areas of mobile programming. As such, the three students attended the Apple TV Hackathon held at Capital Factory on November 22nd, 2015. This all-day programming event consisted of 11 hours where teams competed to build the best application for the brand new Apple TV. The applications that were built were judged based on their innovative design and how well they were executed. 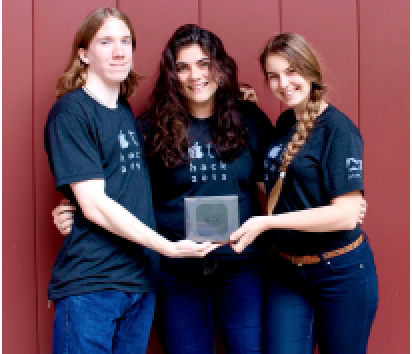 Sophie, Gage, and Maria decided to create an Apple TV application that would act as a second screen in business establishments, offices, or social settings. To do this, they laid down a framework that would act as a client for WordPress. This framework allowed them to use the WordPress API in order to connect template pages from live WordPress sites. The app interface was very customizable and user friendly. The students’ intention to participate in the Apple TV Hackathon was purely to increase their skillset and apply knowledge that they gained from their Mobile Apps course they took at St. Edward’s, but in the end they also won the first place for Creativity and Innovation. “As the instructor of this course, I am really proud of the students who took the initiative to go beyond the classroom and applied their knowledge in the most recent trends of mobile computing”, stated Dr. Shebaro. As the winners, the students walked away with a brand-new Apple TV as their prize. Bioinformatics junior Isavannah Reyes received notification of her acceptance into the Howard Hughes Medical Institute (HHMI) EXceptional Research Opportunities Program (EXROP). She will work in the Protein Design Lab with Dr. David Baker (University of Washington, Seattle), one of 125 scientist mentors in the program, on a research project this summer as well as visit HHMI headquarters in Chevy Chase, MD (suburban Washington, DC) to present the results of her project. Last summer, Isavannah participated in the McNair Scholars Program working with Dr. Charles Hauser (Assoc. Prof. of Bioinformatics) on a project she presented at the Texas Academy of Science: RNA-seq Analysis of Phosphate-stressed C. reinhardtii Cells. Over the next two days, we’ll have reviewers on campus to evaluate our academic programs in Biology and Chemistry. If you see them around, please make them feel welcome. For more information, please contact the NSCI Dean’s Office. Join us at 5:15pm for a meet and greet with Larry Shattuck, Director of Admission. You will get to hear all about the School of Pharmacy and any opportunities specifically for St. Edward’s University students, directly from the Director of Admissions! This is a great opportunity for anyone that is still open to Pharmacy as a potential career path! For more info, contact Jason DeLaRosa. Fellowship guidelines and application form can be found on the Wild Basin homepage, www.wildbasin.org. Contact Amy at jbelaire@stedwards.edu, 512-327-7622, with any questions. Applications are due at 5pm on March 11. Please note that this opportunity does not come with any endorsement from the School of Natural Sciences at St. Edward’s University. Feel free to contact nscidean with questions. Announcing two extraordinary summer field courses in Wyoming taught by faculty from the University of Pittsburgh, the University of Wyoming, the Carnegie Museum of Natural History, and The National Aviary. The courses are open to all majors and have no prerequisites. One course is headquartered adjacent to Yellowstone National Park and provides one month of studies (four credits) of geology, ecology, and environmental politics of the Greater Yellowstone Ecosystem on spectacular daily hikes in the park and Beartooth Mountains: http://www.honorscollege.pitt.edu/yellowstone-field-study/more-information The other course is situated in the Laramie Basin on the Allen L. Cook Spring Creek Preserve, a tract of land that is rich in dinosaur fossils, intact prairie ecology, Native American artifacts spanning 9,000 years, and American history including a section of the original grade of the 1869 Transcontinental Railroad. Its six weeks of studies (six credits) focus on geology, paleontology, and ecology, with small sections in archaeology and Western history: http://www.honorscollege.pitt.edu/wyoming-field-studies A cost of approximately $4,500 for each course covers all expenses including tuition, food, lodging, transportation, camping, hiking, and multiple faculty experts. Admission is on a rolling basis, and time is short. All interested students should please contact me. Edward L. McCord, Ph.D., J.D.